The pleura is a thin membrane that surrounds the lungs. The space between the pleura and the lungs is usually very thin. Pneumothorax is the collection of air or gas in this space around the lungs, which leads to a lung collapse. 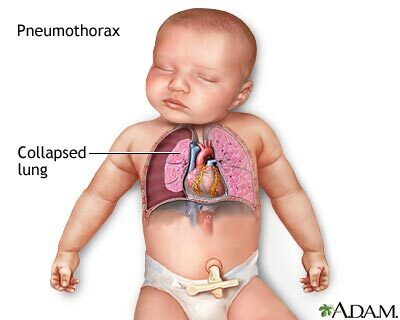 The most common cause of pneumothorax is a breathing machine (mechanical ventilator). Updated by: Kimberly G Lee, MD, MSc, IBCLC, Associate Professor of Pediatrics, Division of Neonatology, Medical University of South Carolina, Charleston, SC. Review provided by VeriMed Healthcare Network. Also reviewed by David Zieve, MD, MHA, Medical Director, Brenda Conaway, Editorial Director, and the A.D.A.M. Editorial team.